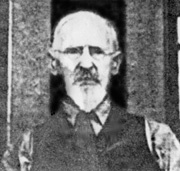 James photographed here at age 83. James Jasper Stubblefield b. 17Feb1837, Polk Co. MO. Married 12Nov11867 La Grande, Baker Co. OR to Louisa Jane Green, b.13Apr111841, Boone Co. MO. James died 31Oct1922 at Portland, Multnomah Co. OR and was buried at the the Rose City Cemetary - Portland on 2Nov1922. James' wife Louisa died 11Jun1912 at Walla Walla, WA and was buried at the Walla Walla Cemetary. 1. Robert Jessie (Bob) b.21Aug1864 La Grande, OR. Died 15Jun1923 at Portland, OR. 2. Anning Presley (Hank) b. 28Jul1866 Weston, Umatilla Co., OR. Died May 1941 Pacheco Pass, San Jose, CA. 3. William Lee (Willie) b. 08Sep1868 Weston, OR. Died 1876 at Elk Flat, Union Co. OR of diptheria at age 8. 4. Elizabeth Rachael (Lizzie) b.06May1871 Weston, OR. Died 25May1890 at Walla Walla, WA. 5. George Washington (Bones) b. 04Jul1872 Weston, OR. Died 29Jul1959 at Portland, OR. 6. Thomas Benton (Tom) b.28Jun11874 Elk Flat (Elgin), OR. Died 20Dec1941 Washougal, Clark Co. WA. 7. Mary Alice (Mary) b.26Jun1876 Elk Flat (Elgin), OR. 8. Amanda Jane (Belle) b.02Jun1878 Elk Flat (Elgin), OR. Died at Portland, OR. 9. John Arthur (Art) b. 16Jun1883 La Grande, OR. Died May1963 Portland, OR. Buried at Roseburg, OR. 10. Ella May (Ella) b. 05Aug1885 Wallowa, Union Co. OR. Died Nov1961 Portland, OR.